Fabulous clean and bright single story 2 bedroom plus a den/office located in the Oak Park Complex. Amenities in this unit include hardwood engineered flooring, a gas log fireplace in the living room, a separate dining area, stackable washer and dryer and wooden shutters throughout. The master suite boasts a large walk in closet with built in safe, and a remodeled bathroom with high end tile and taste! The kitchen features granite counter tops a pantry with built in pull out drawers, dishwasher and a large double basin sink. The sliding glass door from the living room leads to a private patio for gardening, reading or eating alfresco. 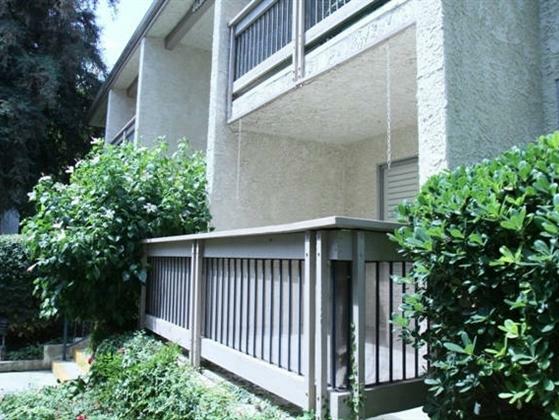 This unit is within walking distance to The Commons, Calabasas Lake and the Swim and Tennis Club. Two covered side by side assigned parking spaces and plenty of guest parking. Easy access to the 101 freeway, and located within the Las Virgenes District too! Just bring your toothbrush...Mrs Clean lived here!